Wondering if your WordPress theme meets the latest standard? Not sure if the developer you hired did a good enough job? In this article, we will show you how to test your WordPress theme against latest standards. The free WordPress theme directory has set high standards for all themes submitted to the directory. Theme developers who want to submit their themes must follow those standards. You can test your theme against these standards to see how good your theme is. First thing you need to do is install and activate the Theme Check plugin. Upon activation, you need to visit Appearance » Theme Check to see it in action. Simply select the theme from the drop down menu and hit the check it button. 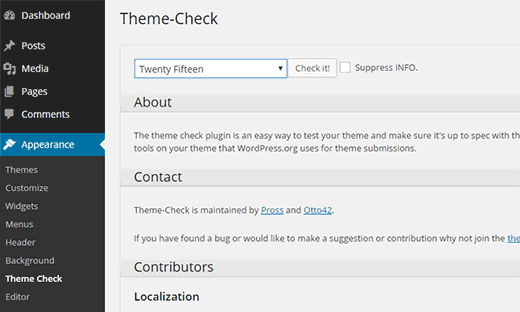 Theme Check will start testing your theme against the latest WordPress theme development standards. Once it is done, it will show you the warnings it found during the tests. What are The Standards this Plugin Checks For? 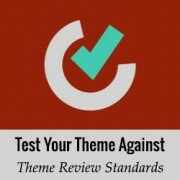 Theme Check was designed to assist theme developers as well as theme reviewers to test WordPress themes against the Theme Review guidelines. These guidelines provide a standard set of minimum requirements for a theme to be considered for inclusion in the free WordPress theme directory. Please note that these warnings and tests may not be significant if you are working on a theme for a client, or your own personal use. On the other hand, if you are considering to release your theme for others to use, then it is a great idea to check that your theme meets the minimum capabilities requirement. We hope this article helped you learn how to check your WordPress theme against the latest standards. You may also want to check out our WordPress theme development cheat sheet for beginners.